Fathers Day is around the corner, so I started looking into some cards for Dad... There are ALOT of Tie Cards! ANYWHO - heres some craftiness to get you started.. Origami is big in these - get that bone folder out! Shirt with Tie & Name Tag This one is listed as a great card for Missionaries - (those cute little guys riding around on bikes from the Church of Latter Day Saints) - BUT would also make a cute Dads Day card. I liked the plain white shirt look with a really poppin' great tie accent. 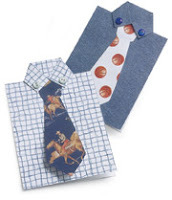 Get creative with the tie - use fabric or textured or designer paper, or stamp it up with Dads favorite theme! Hawaiian Sh irt For those Dads who mix in a little more color in the day-to-day or weekend wardrobe, check out this Origami shirt card! This would be wild in some designer paper - I'm envisioning something from the Specialty selections: Rockabilly, To The Nines; for your Retro Dad something out of Good Morning Sunshine or Pink Flamingo; or for your card playing Dad something from the new Jackpot selection? COOL!! Good Ol' Dad Now this one I really liked - very simple, no fancy origami :-) just a nice double fold and some cutting, and of course the Tie... You gotta love the 4 step card! Easy-peasy! This one would probably be great for Grandpa, or maybe a family friend or your coworker. Simple and tasteful patterns along the lines of Manchester, Parisian Breeze, or Urban Garden sets.. go simple with the tie one this one and maybe just leave it at a nice coordinated card stock. My Favorite! 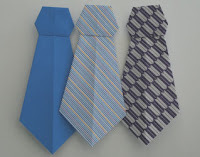 And lastly, just A Tie - again with the origami. Who knew men's wear could be so complex in this day and age! LOL But this is just a Tie, and as mentioned in the directions - many uses: card, prop for a cute skit about Dad, tied onto a nice stuffed animal bearing a gift card, tied onto a nice 6-pack of Dads favorite brew :-) Such possibilities!! Memorial Day - Cards for Heros Blog Hop! Psssssst!! Want a Sneak Peak at the NEW Catalog?